Our prices are inclusive of water, electricity, gas, parking for 1 vehicle (or 2 for Smalla and Bonaguil cottages) beside your accommodation or on an assigned space for premiums, entry to swimming pools, weights room, multisports ground, children's playground, bouncy castles, mini golf, entertainment (except occasionally: theme-based meals, sports activities for which a charge applies). Yes the tourist tax is compulsory for all adults. The rate is currently 0.45€/per day/per person aged 18 or above, however, this may be subject to change during the season and is outside of our control. - On our web site by filling the online form. The booking is fast and the credit card payment is secured (you can also pay via bank transfer, cheque, French holiday vouchers or in 3 installments without additional charges). You have 7 days to secure your booking by sending us the 25% deposit. Name, surname, birthdate of each participant, address, phone number, email address, holidays dates wanted, category and extras wanted. The booking become effective and firm after the agreement of the village and after we receive the 25% deposit (non refundable). Every booking is registered after we received you phone call or your online booking. A booking confirmation is then sent by email or post within 48 hours. What is the choice of pitch package? - You are looking for two pitches and/or rental options together. In this case, the surcharge applies for each booking. - You want a specific pitch, in which case your chosen pitch ensures that a special number is kept for you. If the plot you request is not available on your dates we will inform you before your booking is secured. It may also be possible to reserve a specific pitch or accommodation from the website map. However, we must advise you that the map is not contractual and it’s not a blueprint. If you have any preferences outside the Choice of Pitch package, for example, shady pitch or closeness to the aquatic complex, we will endeavor to meet your requests, however this cannot be guaranteed. When we have received your payment, we will send you your booking confirmation. If we haven’t received your payment by the time it is due, you will automatically receive a reminder. Once your payment has been received and the booking confirmed, we will send you a voucher that you will need to present to Reception on arrival. How can I pay a last minute stay? If your booking is made less than a month before the start of your stay, the full amount is due at the time of booking. If the booking is made a few days before your stay, payment by card will be required. Is it possible to schedule the payment? When and how do I pay the balance of my stay? The balance of your stay is due 30 days before your arrival. 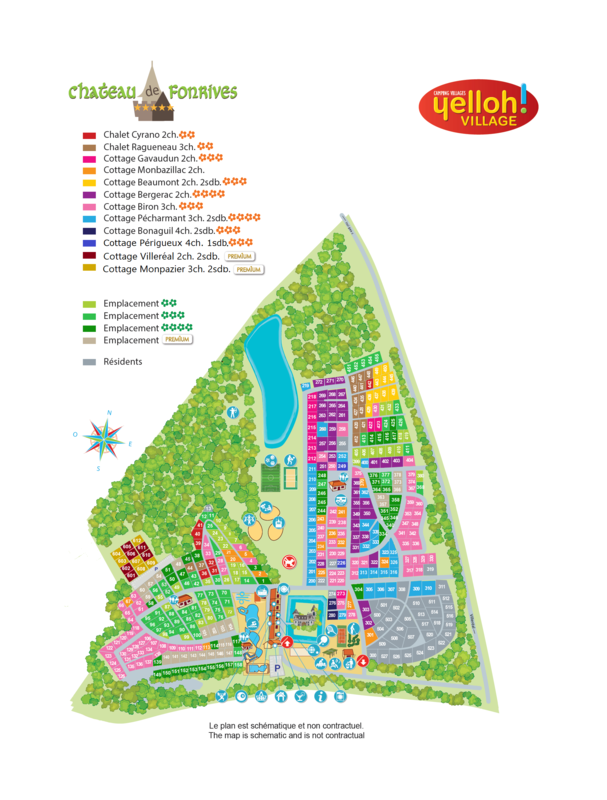 Online payments can be made on the bottom page of this website or on the Yelloh Village website (http://www.yellohvillage.co.uk) in the useful information section by clicking on: “find my reservation and pay the balance”. Enter your internet booking number and the lead name for your booking and then follow the instructions. Or as for the booking, you can pay by cheque, holiday vouchers or bank transfer. Can I book a baby coat and/or a baby chair? You can hire cots (with mattresses) and baby chairs with bath. Baby kit hire must be arranged when booking. Pillows and duvets are included in all accommodation and bed linen and towels are provided in our and accommodations. They are not included for any other category of accommodation but can be reserved at the time of booking or rented directly on site upon arrival. Alternatively, please feel free to bring your own. Pets are welcome and one animal per accommodation is allowed. Please present your dog passport and immunization record on arrival. No dogs listed as Dangerous Dogs in France are allowed, including dogs of 1st and 2nd categories, or NAC. For further information on Dangerous Dogs in France, please check with http://www.ambafrance-uk.org/Pet-cats-dogs-and-ferrets,12197 before making your reservation. Dogs must be kept on a lead within the grounds of the Parc and all mess must be bagged and binned. Pets are not permitted on the meadow but may be walked along the health path and in the woods. A dog shower is available outside the sanitary block number 1. Gas, charcoal and electric (max. 1000 watts) barbecues are also permitted. They are available to purchase from the site shop. Wi-Fi is available free of charge around the auditorium (30 minutes per day), and throughout the village (charge applies). Additionally there are a variety of extended WiFi packages available to purchase on site. Is there supermarkets/ shops nearby? There is a minimarket on site which can provide you with a range of essentials, including fresh bread and local produce. You will also find supermarkets, a 24/24 petrol station and a wide range of shops, bars and restaurants in the local town of Villereal, approximately 3kms away. Can we hire a TV? We do not hire TVs but they are included in and accommodations. Young under 18 have to be with their parents or legal guardians. Can we put an extra tent next to or accomodation? Yes, so long as you remain within the capacity for your accommodation. If you would like to do this, please inform us in advance and we will try to allocate a suitable plot. This is not however guaranteed. Does my baby count as a participant? Yes, babies are included in the capacity for your accommodation. Each accommodation has a maximum occupancy and this must not be exceeded. For example, the four flower Bergerac Cottage has a maximum capacity of four people, in two bedrooms. It is not possible therefore to accept two adults, two children and one baby in this type of accommodation. What are the arrival and departure days? The Parc is flexible in regard to arrival and departure days, subject to availability. This enables you to select arrival and departure days which meet your holiday needs. This applies to accommodation and camping pitches. The minimum length of a stay for accommodation is 7 nights during July and August and 2 nights at all other times during the season. There is no minimum duration for camping pitches. 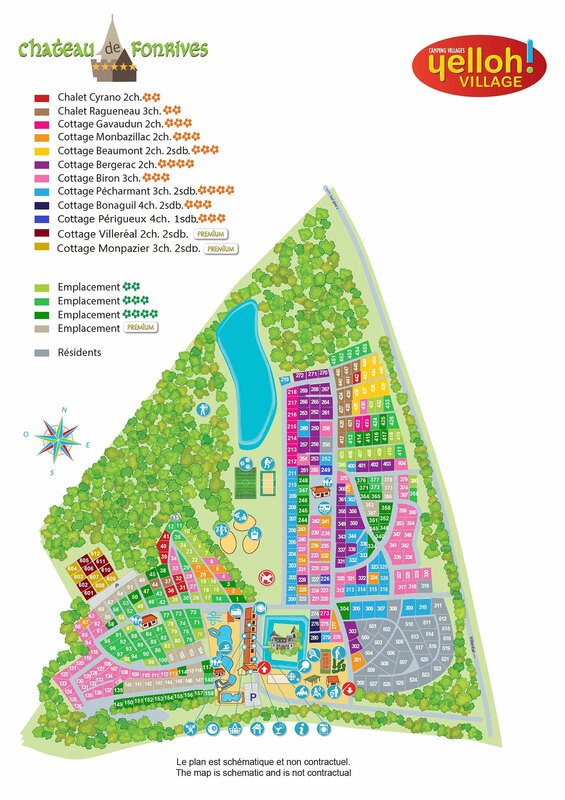 What are the opening dates of the campsite? Our Parc is open from 07th June to the 07th September 2019 and this includes all facilities, including the shop, pools, entertainment, sauna, fitness room etc. What kind of swimming costume is allowed in the pools? Strings and wetsuits are forbidden. The two pools are heated from the beginning until the end of the season. Will I be able to park my car next to my accommodation? Yes, each of our accommodation pitches has enough space to park one car. There is a surcharge of 5€ per night for any other vehicles parked on the pitch. This excludes cottages, as this is a pedestrianised area. You will have a space reserved for you, but you cannot park right beside your rental accommodation. A 20€ deposit is required in exchange for the magnetic barrier badge used to open the security gate. This deposit is fully refunded when the badge is returned. A credit card deposit of 200€ is required per accommodation and will be taken on arrival. This will be refunded after an inventory has been conducted by our teams after you leave, this having also been conducted before you arrive. There is a cleaning service charge of 85€ for any accommodation not left in a clean and tidy condition suitable for use by the next guests (included in ). What are the arrival and departure time? For weekend and short stay packages of 2 or 4 nights (outside July and August), your accommodation will be available from 2pm on arrivals day, and must be vacated by 5pm on departure day. On departure day, your pitch must be vacated by 12 noon. If you arrive after the Reception is closed, you will find your accommodation keys waiting for you, either on the Reception entrance door in a named envelope with an access map. Vehicles are not permitted to enter or exit the Parc between 11pm and 7amand so you will need to leave your car at the main carpark until the morning. It is important that you return to Reception the following morning to confirm your arrival, to complete the checking-in arrangements and to collect your vehicle.